She: Do you want Nexus 5 or Galaxy S5 or iPhone 5s? Its late 2014 and I am not done comparing. So today, let’s talk about an interesting comparison scenario. Imagine you are looking at 2 lists like this and you want to know where items differ. Not which items, but where. That means, you want to know which letters or words in each line are different. Unfortunately, none of the standard features of Excel (formulas, conditional formatting, pivot tables etc.) can help us with this situation. But we don’t have to give up. 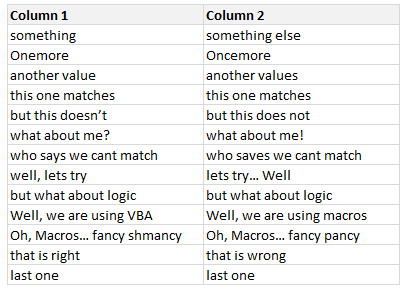 We can use a simple VBA macro to instantly compare 2 lists and highlight mismatched letters or words. How does this macro work? Once you write down this logic, we simply go ahead and implement it in VBA code. The exact workings of the macro are somewhat complex. So I made a video explaining how the code works & what it can do. Please watch it below. Click here to download the comparison macro workbook. Examine the code to understand how it is constructed. Feel free to extend it to suit your work needs. Do you compare lists like this? Every now and then, I end up having a situation where I need to compare by letter or word. I find VBA macro based solution to be perfect for this. What about you? Do you compare lists? Where do you struggle with such comparisons? How would you use this macro? Please share your thoughts & tips in comments. While VBA is pretty powerful & awesome, not many venture beyond the basic recorded macros. You can transform the work, career & skills by learning VBA. It is not at all difficult and anyone can learn it. Start with below links. It's work perfect. But in real world it's not quite practical to put the words or sentence you have to match on same row number of two list. So, is any way macro can match the words or sentences if the matching words are not on the same row. Mr. Chandoo, I do this kind of comparisons very often by using the simple if condition (=IF(B4=C4,"True","False")). I did the same on your data and figured out error in your macro which missed out the following mismatch. However your macro technique is good! what about me? what about me! you can just enter =B4=C4 instead of (=IF(B4=C4,”True”,”False”)) but I don't think both of these formulas can do what Chandoo's macro is doing. I am sorry it did throw error for letter matching! I stand corrected! This looks great! However, most of the time when we need to compare the data, each cell of the 1st column should look for corresponding data in the entire 2nd column instead of the corresponding cell. As it stands now, this code would highlight words 2,3, and 4 of item B, when I would prefer to highlight only word 2 ("really"). Perhaps the logic needs to include a test which, after encountering a difference, searches the remainder of the string for a match (perhaps you could set the threshold for how many consecutive characters have to match in order to avoid false positives). One conservative approach could be to see if it the entire remaining string in item A can be found (in tact) in item B. Maybe I'll give this a shot, but if someone else has ideas on how to accomplish this, I'd love to hear. Thanks for the post, Chandoo! 1. Checking all the second column as already mentioned above in comments. 2. No checking words in sequence as it currently does. For the time being I am putting both these two list in Two separate word files and then running Compare function which mostly serves the purpose. How does this (or does this) differ from using the Fuzzy Lookup addin? For my application, the fact that Fuzzy returns a percent of accuracy makes me very happy. I can see if a value in a list matches my lookup column as a percentage (it matches 95% or 75%). And, I don't have to code it! I have a table in xl file (recipients) to whom i want to send personal data via email (example their medical records - from another spread sheet) again in xl file. It does not work with the same list in two colums any thoughts how to best modify this or another approach? Often I would have Column A with some string and column B containing long strings. Now the column B strings may not really match with column A string as given in Chandoo's example. I would like to colour the whole strings in column A in multiple or long strings in any cell of Column B. How to do this? If I delete the row the macro works perfectly... Any idea? At a first glance, it seems working fine without any side effect. thanks a lot very nice explanation of macro code for comparing data in 2column. it will definately help me. planning for joining u r online vba prog. Nevermind! I didn't have a clear understanding of the marco process. I understand what's happening. This is a truly wonderful macro, but might there be a similar tool for those of us without Excel...say, a tool for Google Sheets? Would it be possible to export this to an independent Excel file and change the colum? Lets say List 1 is in colum J and List 2 in column K.
The macro will identify everything from "late" to its end as different, when it isn't really. How can we identify that it is only "late night" that is in the place of "midnight" ? It is awesome and works for me. Can any one help me on below requirement. I am trying to highlight the as below. I am assuming the above vide/excel talks about comparing the string from the starting. But I just want to compare entire cells. Can any one help me. I executed this macro in one excel says ExcelOne. Now I downloaded another excel name ExcelTwo and I want to run the same macro from ExcelOne to ExcelTwo. How can I do this. This macro is highlighting either complete word or all letters after misspelled letter. I want that this will highlight only the misspelled lette. If column 1 contains Shahzeb and column 2 contains Shahzab then it should highlight only 'e'. First love the Macro, great job, although I'm having trouble if the List1 and List2 have a formula capturing data from other worksheets. I get a Run-time error 13. and the Macro Fails at the follow code: If Not cell1.Characters(j, 1).Text = cell2.Characters(j, 1).text _... If I copy and paste the "text" to another to columns (updating List1 and List 2 locations) the macro runs fine. If I need to find the missing words while comparing 2 ranges. How could I do? Is there any VBA to find missing words? And thanks for this VBA. Great Job done. My issue is in identifying differences in words in 2 different excel files do help me with understanding of simple formulas to apply and get the result. My problem was to find the list of South African countries placed in a column in 1000 rows in a format: austria;algeria;brazil.. I placed all the South African countries in a cell with a delimiter ";". If you have sort of similar problem then below code will work for you making slight adjustments based on your problem statement. Range("B" & i).Value = "Match"